This paper considers change in subjective well-being from engagement in leisure activities, encompassing the arts, culture and sport. Using UK data from waves 2 (2010–2011) and 5 (2013–2014) of Understanding Society, ordered logit, generalized ordered logit, ANCOVA and change score analysis assesses the effects of changing levels of engagement in leisure activities on four measures of subjective well-being, satisfaction with life overall, amount of leisure time, health and job. We find positive changes in (1) life satisfaction from increased engagement in arts events, historical sites and museums, (2) leisure satisfaction from arts activities and events, (3) health satisfaction from arts events and historical sites and (4) well-being measures from increased participation in moderate- and mild-intensity sport. Benefits do not translate to job satisfaction, suggesting a separation of this domain of well-being from leisure. Our analysis suggests important, but differentiated, positive change in well-being from greater engagement in the arts, culture and sport. How do levels of engagement in arts, cultural and sporting leisure activities impact subjective well-being? Do changes in engagement in arts, cultural and sporting leisure activities have differentiated impacts on satisfaction with life overall and individual well-being domains (leisure time, health and job)? Time spent in leisure activities, including the arts, culture and sport, can provide a range of quality of life benefits from positive effects on well-being, to self-development and social and cultural connectedness. Many leisure activities can act as a source of social capital, although this is often derived from informal social connections rather than more formal civic engagements which form the basis of some definitions of social capital (Putnam 2000). Productive, or active, leisure activities have been argued as acting as a source of social capital associated with civic engagement, although consumptive, or passive, leisure activities, e.g. watching professional sports, do not (Van Ingen and Van Eijck 2009). Well-being derived from leisure may have global impacts on subjective well-being, through five psychological mechanisms, specifically: (1) detachment–relaxation, i.e. leisure providing separation and recovery from work; (2) autonomy, which reflects individuals having control over the way time is spent; (3) mastery, referring to well-being derived from immersion or focus on a leisure activity that provides development and/or learning opportunities; (4) meaning, i.e. the relevance of leisure in providing meaning and purpose to the individual; and (5) affiliation, which refers to well-being derived from social interaction or connectedness (Newman et al. 2014). It is argued that there is a consistent need for a time input which can be spent in leisure activities (Ateca-Amestoy 2011, pp. 54–57). Leisure experiences and impacts on well-being may, as such, differ between individuals including the need for the presence of certain features, e.g. social interaction and materialism (Ateca-Amestoy 2011, pp. 54–57). An expanding international body of literature has explored the relationship between leisure activities, such as the arts, culture and sport, and self-assessed well-being. Brajša-Žganec et al. (2011), using sample survey data from Croatia, consider participation in 15 different leisure activities including a number which constitute the arts, culture and sport. Their results suggest that cultural activities, including visiting exhibitions, attending the theatre, reading books and attending concerts, contribute significantly to higher levels of reported well-being. Italian-based research using a survey of 1500 individuals found reading books, visiting the cinema and the theatre and participating in sports to have high relevance to reported well-being (Grossi et al. 2011). Bryson and MacKerron’s (2016) UK-based large-scale primary research found ‘theatre, dance, concert’, ‘exhibition, museum, library’ and ‘sports, running and exercise’ to be ranked second, third and fourth, respectively, behind intimacy and love making, as activities which have a positive effect on reported happiness. More recent research using cross-sectional UK data from Understanding Society provides evidence of a large number of these leisure activities having a positive relationship with measures of general happiness, life and leisure satisfaction (Wheatley and Bickerton 2017). Engagement in these activities was not, however, found to spillover into job satisfaction with the exception of participation in sport. It is argued this may reflect individuals perceiving time spent in work and leisure separately. The relative frequency and intensity of engagement in leisure activities has also been argued as an important factor (Marsh et al. 2010; Downward and Dawson 2016; Wicker and Frick 2015). Research has found that more frequent participation in certain activities, e.g. arts activities and sport, may generate more positive effects on well-being (Kavetsos 2011) or in some cases be necessary to generate well-being benefits. Equally, positive well-being effects are associated with other activities at lesser frequencies, e.g. arts events, museums and historical sites (Wheatley and Bickerton 2017, pp. 39–40). Research focusing specifically on the arts and culture is indicative of a number of positive relationships with well-being. Recent UK-based research by Hand (2018) uses quantile regression techniques to consider the well-being effects of engagement in the arts. Findings suggest positive subjective well-being effects at lower levels of happiness, but that these effects may be subject to diminishing returns on happiness at higher levels. Hand (2018, p. 12) posits this could reflect both that the sense of escape and enjoyment derived from the arts may have a lesser effect on someone who is already happy, and that social benefits from engagement in the arts may similarly be lesser among those who are already happy. A number of studies have shown positive contributions from the following activities to subjective well-being: music and creative art activities (Cohen 2009; Cameron et al. 2013; Creech et al. 2013; Green 2016; Wang and Wong 2014, p. 100; Wood and Smith 2004) which may act as a source of inspiration and motivation, as well as influencing identity (Green 2016); museum visits, which are associated with benefits to psychological well-being, social interaction, relaxation and stress reduction (Chatterjee and Noble 2013; Packer 2008); libraries, which have been suggested to offer potential mental health benefits, e.g. use of books in therapy (Fanner and Urquhart 2008); and sport, recreational exercise and fitness which generates well-being benefits through mental and physical stimulation, and social capital and affiliation benefits associated with the enhancement of social networks (Cabinet Office 2015; Downward and Rasciute 2011; Hamer et al. 2009; Kavetsos 2011; Nichols et al. 2012; Schüttoff et al. 2018; Taylor et al. 2015). Benefits of sports, recreation and fitness have also been suggested to spillover positively into job satisfaction (Hecht and Boies 2009, pp. 421–422; Wheatley and Bickerton 2017). Michalos and Kahlke (2008, 2010), however, argued that relative to factors commonly found to have a significant impact on overall life satisfaction, e.g. health and financial position, arts activities have relatively little impact. Short-term funding has been argued as one factor which may explain the limited ability of certain arts projects to have a sustained impact on health and well-being (Cameron et al. 2013, p. 59). Marsh and Bertranou (2012), using UK data from the British Household Panel Survey, suggest that well-being effects from cultural engagement may be overestimated in research and stress the importance of considering factors such as income in analyses. Disparities in access to arts and cultural amenities, including as a result of socio-economic status, could also offer some explanation as to variations in reported well-being benefit. It has been found, for example, that this may act to limit the ability of certain socio-economic groups to benefit from the positive well-being effects associated with some arts and cultural activities, e.g. museums and historical sites, which may be remote geographically or expensive to access at least in relative terms (Cameron et al. 2013, p. 55). Similarly, Grossi et al. (2012) considering culture alongside other well-being determinants such as health, highlighted the role of access in generating well-being benefits. They found that access to cultural activities is second only to health status in factors affecting well-being. Finally, Huang and Humphreys (2012) reported in their study of participation in physical activity and self-reported happiness using US data for 2005–2009 that close proximity to sports facilities acts as an important mediating factor. The evidence base is indicative of arts, cultural and sporting leisure activities having a positive relationship with subjective well-being, albeit with differences associated with the frequency and intensity of leisure pursuits and between different leisure activities. However, existing research is largely based on cross-sectional and smaller-scale studies, which are often unable to adequately account for causality in the relationships observed, meaning that other factors, e.g. socio-economic conditions, could act as more prominent drivers of well-being variations reported among those engaging in different leisure activities. To explore the relationship between engagement in leisure activities and subjective well-being, panel data are extracted from waves 2 (2010–2011) and 5 (2013–2014) of Understanding Society, alternatively titled the United Kingdom Household Longitudinal Study (UKHLS). Understanding Society is a longitudinal sample survey of 40,000 households, comprising face-to-face and telephone interviews capturing data from adult (aged 16 and over) household members. The aim of Understanding Society is to enhance knowledge of social and economic change at household and individual levels (Understanding Society 2012). This data set provides insight into engagement in a wide range of arts, cultural and sporting activities, comprising 70 activities in total, as well as capturing relevant measures of subjective well-being. Waves 2 and 5 of the survey are used as they contain modules on leisure activities. Leisure activities are grouped into arts activities, arts events, libraries, archives, museums, historical sites and moderate- and mild-intensity sports. The dependent variables in the analysis comprise both overall life satisfaction and domain satisfaction measures (van Praag et al. 2003), amount of leisure time, health and job. These variables are derived from seven-point Likert scale questions, where 1 = completely unsatisfied and 7 = completely satisfied. The measures of engagement with arts, cultural and sporting activities are derived from questions of the following form, ‘how often in the last 12 months have you been to events such as this?’ with possible responses for arts and cultural activities as follows: ‘none’; ‘once in past year’; ‘twice in past year’; ‘at least 3–4 times per year’; ‘less than weekly, at least monthly’; and ‘at least once a week’. For sporting activities, responses are: ‘do not do any sport’; ‘once in past year’; ‘twice in past year’; ‘at least 3–4 times per year’; ‘at least once per month’; ‘1–3 times a week’; and ‘3 + times a week’. In addition to the focus variables, a number of socio-economic and demographic independent variables are included as controls as they have been shown in existing research as being relevant to subjective well-being [see Dolan et al. (2008) for a comprehensive discussion]. These variables include age, gender, disability, marital status, number of dependent children, government office region, economic activity, occupation (job satisfaction model only), annual household income (£000s), working hours and overtime hours. Other common uses of leisure time, including TV watching and social media, are not included in the estimations as modules containing these questions are included in different waves of Understanding Society. Ordered logit, generalized ordered logit, ANCOVA and change score analysis are conducted. Ordered logit models provide a robust method of analysis when estimating discrete ordered choice-dependent variables. They are used to provide initial insight into the relationships between engagement in leisure activities and measures of subjective well-being. The survey waves are pooled in the logit models to provide an overall estimation of the relationships observed. The output includes predicted probabilities for factor changes at one standard deviation which allows interpretation of the magnitude of the impact of variations in the independent variables on the likelihood of the dependent variable. The use of panel data also necessitates the correction of standard errors in the models for clustering by multiple observations of individual sample members (see Henley 2016). Ordered logit/probit regression is founded upon an underlying assumption referred to as the parallel lines or proportional odds assumption. The models assume that the relationship between each pair of outcome groups in the dependent variable is the same, e.g. coefficients for respondents who are completely unsatisfied with life versus all higher categories are the same as those that describe the next lowest category (mostly dissatisfied) and all higher categories. When this relationship does not hold, the parallel lines assumption is violated. An additional stage of analysis is therefore performed using generalized ordered logit estimation. The partial proportional odds model is used with the autofit feature which retains the parallel lines assumption for variables where it is applicable, but relaxes it for those which violate the assumption (see Williams 2005). Coefficients can be interpreted consistent with those of binary logit models, i.e. the first panel of coefficients can be interpreted as those from a binary logit regression where satisfaction with life is recoded as 1 versus 2 + 3 + 4 + 5 + 6 + 7. The second panel can be interpreted as those where satisfaction with life is recoded 1 + 2 versus 3 + 4 + 5 + 6 + 7. Positive coefficients reflect that higher values of the independent variable make higher values in the dependent variable more likely. The primary contribution of this paper is in assessing the impact of changes in engagement in leisure activities on subjective well-being. An advantage of panel data is that it enables observation and analysis of change. The analysis uses ANCOVA and change score models. This follows the approach of Lim and Putnam (2010) who applied these methods to explore the impacts of religion on subjective well-being using the US Faith Study and Wheatley (2017) who used Understanding Society to explore the impacts of discretion in paid work on subjective well-being. Combining ANCOVA and change score models provides robust evidence of the impacts of changing levels of engagement in arts, cultural and sporting leisure activities on reported well-being. The ANCOVA models incorporate the measure of satisfaction for the previous period (wave 2 in this case) into the logit estimations to adjust for initial differences in satisfaction, while the change score models consider the differences in satisfaction between survey waves, measuring outcomes at wave 5 against those at wave 2, i.e. changes in reported satisfaction relative to levels of engagement in leisure activities. The sample sizes for the ANCOVA and change score analysis are smaller, approximately half of the pooled sample, as they measure differences between survey waves. The R2 values in these models are relatively low. In the ANCOVA models (and extending to the prior logit analysis), the pseudo-R2 values are less reliable than standard R2 values and should be interpreted with caution. Lower R2 values in the change score analysis reflect in part that these models do not include all controls, and are consistent with results present in other research employing this technique (Lim and Putnam 2010). Lower R2 values are also common in models considering aspects of human behaviour as there is greater variation present in the data. Patterns of engagement in arts, culture and sport from waves 2 (2010–2011) and 5 (2013–2014) of Understanding Society are summarized in Table 1 along with descriptive statistics for the other variables used in the analysis. The descriptive statistics reveal a fairly even gender split and demographic mix, albeit with some over-representativeness among retired individuals compared with UK population estimates, also evident in the average age of the sample (ONS 2015). Arts and culture are activities which are engaged with relatively less frequently than sport, although a considerable portion (37.3% on average) of those reporting arts activities which involve more active participation, e.g. playing musical instruments, do report regular frequency equating to ‘at least once per week’. Museums and historical sites are most commonly visited ‘one to four times per year’. Less commonly used are libraries and archives. Just under a third of respondents on average reported visiting a library ‘at least once per year’; however, very few respondents reported making use of archives. The proportions of respondents reporting engagement in the leisure activities considered remained relatively stable between waves 2 and 5 of the survey. The only exception is engagement in arts activities which increased notably from 51.5% of all respondents in wave 2 reporting some level of engagement to 66.4% in wave 5 of the survey. The logit estimations summarized in Table 2 provide initial analysis of the relationship between arts, culture and sports activities and subjective well-being. The logit models, consistent with existing research, suggest a number of positive associations between arts, cultural and sporting leisure activities and the four measures of subjective well-being (Brajša-Žganec et al. 2011; Hand 2018; Wang and Wong 2011, 2014). The results in Model 1, which considers life satisfaction, suggest that engagement with the arts, through both arts activities and events, has a positive and statistically significant relationship with life satisfaction. Visiting museums and historical sites, and participating in moderate and mild sport on a more frequent basis is also associated with greater life satisfaction (Wicker and Frick 2015). Visiting historical sites is associated with higher levels of subjective well-being in all satisfaction measures apart from job satisfaction in model 4. Greater engagement in moderate- and mild-intensity sports also has positive associations with all of the measures of subjective well-being (Taylor et al. 2015; Downward and Rasciute 2011). In model 2, in addition to the aforementioned historical sites and sporting activities, arts activities, arts events and museums are found to have a positive relationship with leisure satisfaction. Health satisfaction, in model 3, is positively associated with attending arts events. In contrast to the results of models 1 and 2, visiting museums does not generate statistically significant results for health satisfaction. Finally, in model 4 arts activities have a positive relationship with job satisfaction. This finding could reflect the benefits of social interaction associated with the networks developed and maintained through more active involvement in the arts (Nichols et al. 2012). Using libraries and archives is found to have some negative associations with measures of well-being including statistically significant results for life and job satisfaction for libraries, with these results potentially reflecting the influence of other characteristics, e.g. socio-economic status, among those using these amenities (Wheatley and Bickerton (2017). Ordered logit estimation: subjective well-being measures and leisure activities. The control variables generate results consistent with the extant literature. Estimates for demographics such as age (Blanchflower and Oswald 2004), gender (Dolan et al. 2008), presence of a long-term illness or disability (Lucas 2007), educational qualifications (Blanchflower and Oswald 2004), marital status (Qari 2014, p. 37) and dependent children (Dolan et al. 2008) are all relatively consistent with existing evidence. Explanatory variables related to economic activity align with negative well-being impacts of economic inactivity and unemployment (Knabe et al. 2010, p. 875; Krueger and Mueller 2012, pp. 598–599). Annual household income has a positive association with life and job satisfaction reflecting the socio-economic links between job, income and quality of life. However, income has a negative relationship with leisure satisfaction reflecting the trade-offs created as paid work limits quantity of leisure time (Knabe et al. 2010). Satisfaction with health does not have a statistically significant relationship with reported income. Trade-offs arising from paid work are also manifest in negative relationships between satisfaction levels and hours of work and overtime (Blanchflower and Oswald 2004), although some coefficients are statistically insignificant. Finally, in model 4, highly skilled occupations are associated with higher levels of job satisfaction. The logit estimations indicate a number of positive relationships between subjective well-being and engagement in the arts, culture and sport, including overall life satisfaction and satisfaction with the domains of leisure time and health. Lesser statistical significance is found, however, between engagement in these leisure activities and job satisfaction, in line with the findings of existing research. To ensure the robustness of the relationships observed generalized ordered logit models were used to test and control for the parallel lines assumption present in logit regression. The results of the models are summarized in the Appendix for the leisure activities. For arts activities and visiting library and archives, the parallel lines assumption holds for all models, and results across each pair of outcome groups are the same. For the remaining arts, culture and sport variables, results generally show consistent relationships between outcome groups. There are, however, two exceptions. For arts events and historical sites, at the highest levels of reported well-being, positive relationships observed at other levels become negative (although some results are statistically insignificant). This finding is consistent with those reported in Hand (2018) and could similarly reflect diminishing returns on well-being from engagement in certain activities among those reporting the highest levels of well-being. While the logit and generalized logit models indicate a number of subjective well-being benefits, a further stage of analysis is required which can provide evidence of the impacts of changes in engagement in arts, culture and sport on subjective well-being. ANCOVA and change score techniques are therefore employed with results summarized in Table 3. Panel change models: satisfaction and leisure activities. The ANCOVA and change score models provide important findings which extend the logit analyses by offering specific insight into the impacts of changes in frequency of participation in arts, cultural and sporting leisure activities on well-being between survey waves. We find positive subjective well-being impacts arising from greater engagement in arts, cultural and sporting activities. The ANCOVA models suggest positive impacts on overall life satisfaction arising from greater engagement in arts events, historical sites and moderate and mild sports, evident in the positive and statistically significant coefficients. Leisure satisfaction benefits are also found arising from higher levels of engagement in arts activities and events, historical sites and both moderate and mild sports. Satisfaction with health is also higher among those reporting increases in engagement in arts events and moderate and mild sports, with the findings related to sport consistent with the health benefits of more active lifestyles (Cabinet Office 2015; Hamer et al. 2009; Taylor et al. 2015). The change score models are consistent for the most part, providing evidence of positive change in the reported well-being measures. The magnitude of effects is particularly large among those reporting greater engagement in arts events and sporting activities, especially those related to moderate sport and health satisfaction. Positive change in life satisfaction is also significantly related to more frequent museum visits, although this relationship is weaker. Some impacts on overall life satisfaction and from visiting historical sites are not statistically significant in the change score models. In the case of historical sites, this could reflect the changing relationships observed across outcome groups in the generalized ordered logit analysis. 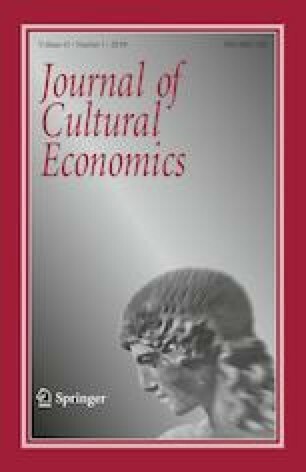 Finally, the benefits of arts, culture and sport to life, leisure and health satisfaction do not appear to translate into job satisfaction, providing further support to the suggestion of a separation of this aspect of well-being from leisure, as has been posited in previous research (Wheatley and Bickerton 2017). The estimation results also suggest some negative impacts on measures of well-being including those associated with use of libraries and archives, although there are inconsistencies in these results casting some doubt on these findings. These results could reflect engagement among individuals who report lower levels of satisfaction due to other factors, e.g. socio-economic status. Both of these forms of leisure activity are less common in engagement, though, resulting in smaller and potentially less reliable samples in Understanding Society which could, at least partly, attain to the mixed and in some cases anomalous results, e.g. the positive impact of archives on job satisfaction. Notwithstanding these findings, the ANCOVA and change score models present novel evidence suggesting that greater engagement in arts, cultural and sporting activities has a number of positive impacts on subjective well-being. In addition, these impacts are differentiated by measures of subjective well-being and appear particularly strong with respect to leisure satisfaction. This paper has contributed to our understanding of the impacts of engagement in leisure activities, encompassing the arts, culture and sport, on subjective well-being. Ordered logit, generalized ordered logit, ANCOVA and change score models, using UK data from waves 2 (2010–2011) and 5 (2013–2014) of Understanding Society, have been used to assess the effects of changing levels of engagement in leisure activities on four measures of subjective well-being, satisfaction with life overall and satisfaction with the domains of leisure time, health and job. The results of the analysis extend existing studies which have largely presented evidence from analyses of cross-sectional or smaller-scale data and shown positive associations between engagement in leisure activities and subjective well-being. The findings from the ANCOVA and change score models contribute to existing understanding as they provide evidence of factors causing changes in subjective well-being (Huang et al. 2018), in this case levels of engagement in arts, cultural and sporting leisure activities. In addition to the findings suggesting a number of subjective well-being benefits may be derived from changes in engagement in the arts, culture and sport, we further extend the literature on the well-being impacts of these leisure activities by identifying that these impacts are differentiated by type of activity and measure of well-being. The ANCOVA and change score analysis finds positive changes in (1) life satisfaction from increased engagement in arts events, historical sites and museums, (2) leisure satisfaction from arts activities and events, (3) health satisfaction from arts events and historical sites, and (4) benefits to well-being measures from increased participation in sport, especially that which involves more active engagement. The results also suggest that well-being benefits from increased engagement in arts, culture and sport are particularly positive for satisfaction with leisure time, as we might expect given these activities are engaged with during leisure time. These benefits do not for the most part translate into job satisfaction, however, suggesting a separation of this domain of well-being from leisure. The differentiated impacts may suggest that some activities have more channelled effects on well-being and that domains of well-being themselves, while having clear intersection, can be impacted in different ways by how we spend our time. In some cases, though, the results may simply reflect the activity itself, e.g. the relationship observed between being more physically active through participation in sport and health satisfaction. The empirical findings have a number of implications for research into well-being and that which considers the value of arts, culture and sport. The findings suggest that increases in self-reported well-being can be realized from engagement in certain leisure activities. They also highlight the benefits of active participation, including health benefits associated with sports, and social interaction benefits of both sport and more active involvement in the arts. While the findings alone cannot provide a rationale for continued or extended funding of these activities, they are clear in evidencing a number of positive impacts on reported well-being which does correspond to the argued societal benefits of the arts, culture and sport. This strengthens arguments for increased availability and access to the arts, culture and sport, highlighted in existing research as an important factor in mediating relative subjective well-being impacts of leisure activities. The differentiated impacts present in the results for specific well-being domains further suggest that engagement in a range of activities, and those involving more active participation, may be beneficial for individuals if they are to maximize the potential well-being benefits which can be derived from their leisure time. Further research is required, however, to provide greater insight into the exact drivers of the differentiated effects observed and to enhance understanding of how different leisure activities impact our lives. The analysis is subject to certain limitations. While drawing on large-scale panel data from Understanding Society, the empirical estimations only consider two waves of data due to periodic inclusion of modules on engagement in leisure activities in the survey. Given the wide range of activities, some of which are relatively less commonly engaged in, this does limit the robustness of some of the empirical estimations, e.g. those pertaining to libraries and archives. Measurement validity also represents a concern with the use of ordered response Likert scale questions on well-being, although a substantive and expanding evidence base supports the validity and comparability of these measures (Stutzer and Frey 2010, pp. 684–687). Finally, while the analysis effectively captures the impacts of leisure activities on different measures of subjective well-being, cultural participation may have substantial eudemonic content which extends beyond the impacts of the measured leisure activities. Acknowledging these limitations, this paper has contributed to our understanding by providing evidence of the positive and differentiated impacts on subjective well-being of greater engagement in a range of arts, cultural and sporting leisure activities. The research utilized secondary data and as such did not involve research involving human participants and/or animals and/or informed consent. Generalized logit regression models: arts, culture and sport variables summary. Cabinet Office. (2015). Sporting future: A new strategy for an active nation (online). https://www.gov.uk/government/uploads/system/uploads/attachment_data/file/486622/Sporting_Future_ACCESSIBLE.pdf. Crown Copyright. Marsh, K., MacKay, S., Morton, D., Parry, W., Bertranou, E., Lewsie, J., Sarmah, R., & Dolan, P. (2010). CASE: Understanding the drivers, impact and value of engagement in culture and sport (online). Department for Culture, Media and Sport, https://www.gov.uk/government/uploads/system/uploads/attachment_data/file/71231/CASE-supersummaryFINAL-19-July2010.pdf. Office for National Statistics (ONS). (2015). Overview of the UK population: November 2015 (online). Available at: https://www.ons.gov.uk/peoplepopulationandcommunity/populationandmigration/populationestimates/articles/overviewoftheukpopulation/2015-11-05. Accessed July 2017. Taylor, P., Davies, L., Wells, D., Gilbertson, J., & Tayleur, W. (2015). CASE: A review of the social impacts of culture and sport (online). Department for Culture, Media and Sport, https://www.gov.uk/government/uploads/system/uploads/attachment_data/file/416279/A_review_of_the_Social_Impacts_of_Culture_and_Sport.pdf. Accessed July 2017. University of Essex. (2012). Institute for social and economic research. NatCen Social Research and Kantar Public, Understanding Society: Waves 1–6, 2009–2015. 8th Edn. Colchester, Essex: UK Data Archive, November 2016. SN: 6614, https://doi.org/10.5255/ukda-sn-6614-9. Williams, R. (2005). Gologit2: A program for generalized logistic regression/partial proportional odds models for ordinal dependent variables (online). Available at: https://www.stata.com/meeting/4nasug/gologit2.pdf. Accessed July 2017.